Widely regarded as one of cinema’s most accomplished directors, David Lean helmed such classics as Brief Encounter, Great Expectations, and Oliver Twist. He twice received the Academy Award for best director, and two of his films, The Bridge on the River Kwai and Lawrence of Arabia won the Oscar for best picture. Both are featured on the American Film Institute’s Top 100, with Lawrence of Arabia at number seven. Despite the awards and accolades for these motion pictures, many critics often look more favorably upon the smaller films that Lean produced earlier in his career, and in recent years his reputation as a director has diminished.In this study, Constantine Santas seeks to restore these now undervalued epics to the elevated esteem they once held. Without dismissing the earlier works or regarding them as irrelevant to Lean’s evolution as an artist, this book shows that the epics, if analyzed from certain vantage points, are as worthy as any of Lean’s previous films. In addition to Lean’s Academy-Award-winning blockbusters, Santas also provides close analytical looks at Doctor Zhivago, Ryan’s Daughter, and the director’s final film, A Passage to India.Santas argues that the epics show a progression and refinement of Lean’s work and that they are thematically broader and feature more complex characterization than his earlier films. In his analyses, Santas provides background material on the production of each epic; insights into structure, characters, techniques, and themes; and a look into the relationship between the films and their literary sources. 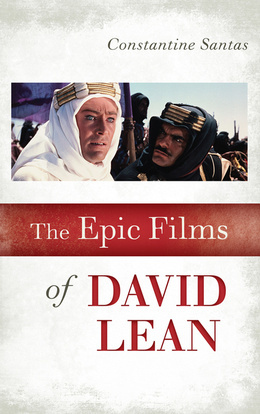 Written in a clear and engaging manner, The Epic Films of David Lean will appeal not only to cinema students and scholars but also to the general fan of David Lean and his work.